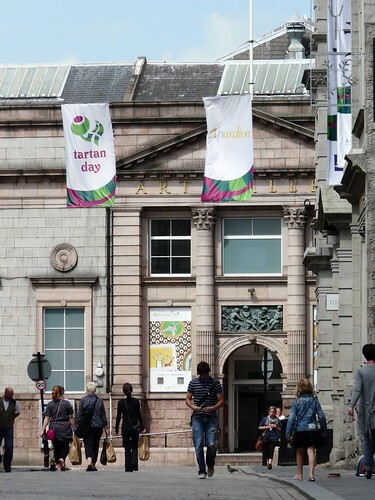 Aberdeen gets a bad rap. True, it’s not as pretty as Edinburgh and it doesn’t have the buzz of Glasgow. It’s also quite possibly the coldest place on Earth when the wind picks up (as it often does) and on a dull day when you are surrounded by granite and beneath a slab of sky it can feel like you’re walking in a concrete box. But it’s a town I know well – I was brought up just outside the city limits – and I have a great amount of affection for it. The buildings are a mixture of grand and quaint, the seagulls are bold, the pies are fantastic and on a blue sky day that grey, grey granite sparkles gently in the sun. 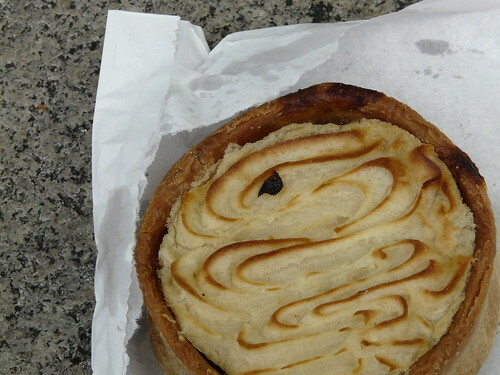 The second last photo is of the tattie pie that I bought from the Auld Toon Bakery for my lunch. 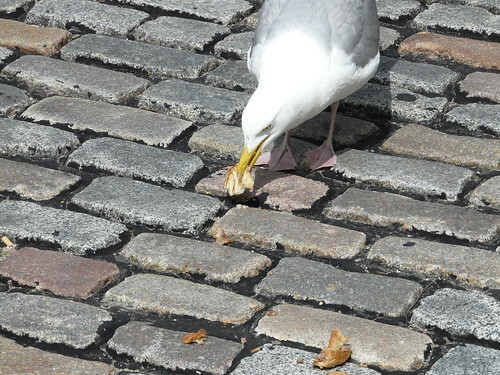 The final photo is of the bird that pecked it from out of my hands as I walked down the High Street then devoured it before my eyes. i want a mince pie!!!!!!!!!! The Melbourne term for that seagull is ‘more front than Myers’ (Myers being a big department store) – not sure if there is an Aberdonian equivalent saying. I want a tattie pie! Aberdeen doesn’t look too bad. I have an old friend that once bought a t-shirt from a used clothing store. The shirt read, “Everybody’s Somebody in Aberdeen”. We always wondered if that implied Aberdeen, Scotland OR Aberdeen, South Dakota (a truly tiny, crummy town in the middle of nowhere). Maybe it was implying BOTH. Well, I think Aberdeen is just the sort of place I’d enjoy. Your photos certainly do it credit. 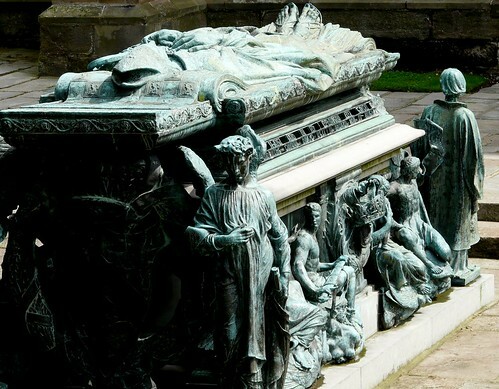 Do you know the history of that sepulchre? Looks like it might house a religious figure? It’s quite majestic. 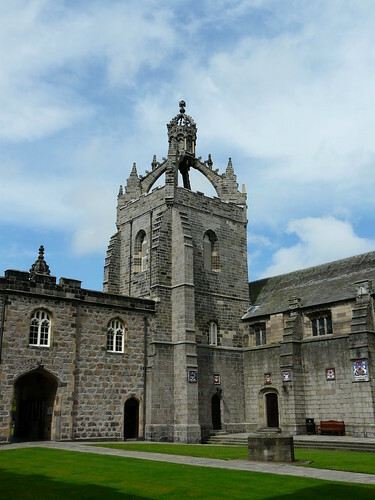 It’s Bishop Elphinstone, the founder of the University of Aberdeen. 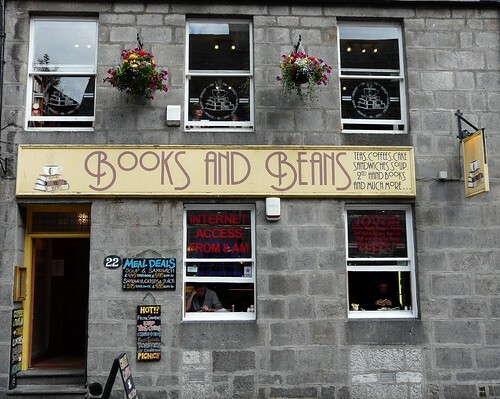 Ah, Books and Beans, what a great place to lunch. If I were having a pie though, it would have to be a macaroni one! Brilliant! Respect to the gull! My cat once did something similar to a neighbours omelette – right off the plate. I grew up on a base that was nearby so we used to go to Aberdeen to shop. Glasgow was were we had the dreaded swimming lessons with the highdive. Aberdeen had the pretty glass jars! We visited a friend in Aberdeen a couple of years ago and had a brilliant time – we loved the harbour area, saw a puffin at the RSPB cliffs and Tosca on a large screen in Duthie Park as it was performed live at the Royal Opera House in London. We had glorious sunshine and all the other screenings around the country were watched from from underneath umbrellas. Nobody could quite believe it! Books and Beans! – the cutest name for my type of shop! Find it rather amusing that it was supposed to be for inside the chapel but was too big to get through the doors! CN – Pretty glass jars? Heather – Very glad you like it. Many people don’t. Nip it in the bud – Glorious sunshine, puffins and opera – sounds wonderful!! I spent four months in Aberdeen in 2006 on an Erasmus exchange program and although I must admit the cold weather did affect me greatly(and I’m Norwegian!) I did love the architecture and the laid back feel of the place. I’ve forgotten the name of my favourite bar to hang out and read after lectures but I do remember that my favourite supermarket was Morrisons. Also remember walking through Seaton park after a night out and feeling so so so scared because everyone said it was such a dangerous place at night! Lovely pictures! I dream of traveling to Scotland one day! Love the stone buildings and all the brick and cobblestone. 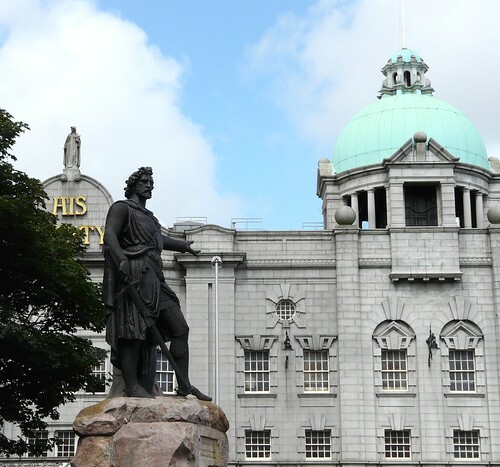 I haven’t been to Aberdeen since my sister was there 30 years ago to attend Robert Gordons. She lived in the quaintly named ‘Rosemount Viaduct’ – just above the bookies!!!! Seagulls are getting just a bit too bold these days, aren’t they? You have represented Aberdeen well and I have to agree with you on the temperature front. It’s a bracing wind that bla’s in the Granite City! How absolutely beautiful! I would so, so love to visit there. Maybe one day….sigh…. Love your pics. I miss Aberdeen. We were there for Christmas this year. It was cold, but wonderful. I especially miss the food….ah……..
Hey I just stumbled across your site and ended up on this page! 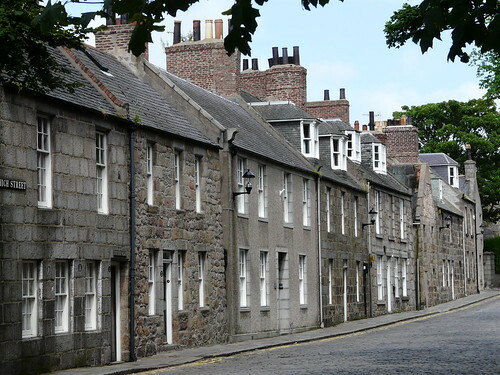 I work in the Old Aberdeen/ Seaton area as a Police offiicer in Aberdeen and it really is a lovely part of the city! Perfect for students! 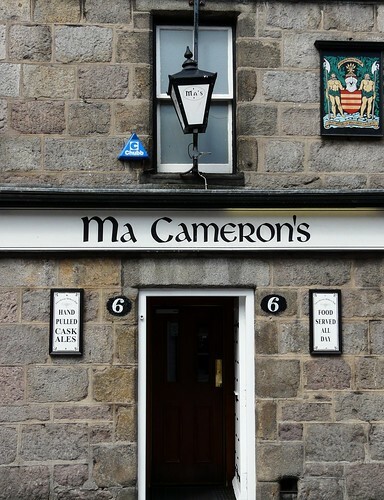 Aberdeen has the best pies! Macaroni or Chicken pies from Thains the Bakers!!…..FINE! 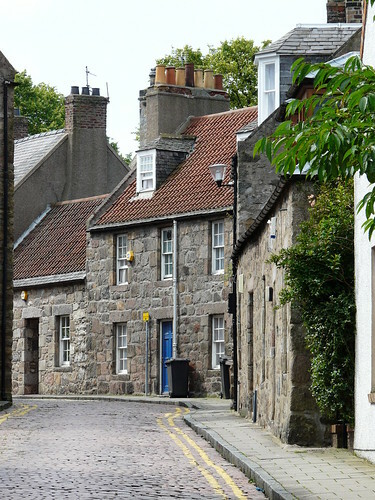 Thank you for sharing some nice snaps of Aberdeen. You’re right, it is not as pretty as Edinburgh but it does have some great spots – the long, long shore is just amazing. We have a small cottage there and might have to let it go until next February until we are full time in Cambridge – I feel really sad.